Evolving from the field of corporate organizations that started to embrace design thinking of new products and services some years ago, co-creation and co-design processes involving the “end-user” or “client” have raised recently in many ways and shapes. Usually, however, in closed environments where knowledge is gathered as strategical value, processed and packeted only afterwards in order to enter the Market. Also based on different interpretations of the core philosophy of collaborative creation, aligned in many cases with the most “egoist” versions ofcrowdsourcing, where ideas and energy from the “crowd” generate material or non-material goods for a proprietary organization, which only at the end of the production process are back available to society (but then too much constricted with a specific prize and shape). But apart from improving and managing Goteo, another of the important fields of action for us is the “co-creation factor”, where from the early beginnings of the tool we started in parallel to facilitate crowdfunding workshops with different communities of practice and interest, applying our own methodology based in previous workshop experiences leaded by Platoniq like the Bank of Common Knowledge,Ideiazoka / Market of rebounding ideas or UrbanLabs, as well as participating (sometimes with a bit of frustration about ephemeral results) in hackathons, barcamps and other type of unconferences. From working around shared criterias and indicators around crowdfunding, to brainstorming about campaigns rewards (or even applying some gamification to sessions), usually P2P applied to offline “face-to-face” dynamics proves very useful for learning. When preparing avatars associated to roles and skills for accreditation, the more related to the area or context of the workshop the better for engaging participants and generate curiosity from an early beginning. Because it’s all about working in groups, and iteration. More specifically: breaking into small operative units of people, which can manage to discuss and create together. Then reporting to the rest, comment and decide collectively. Then breaking into groups again in order to go further. For doing this, the “rules of the space” should be clear but minimum. For example we encourage adapting some of theprinciples from open space technology, which for us usually make a lot of sense. As an “appetizer” that helps to benchmark previous examples by sharing good (or also bad) creations, the ideal setting is based on the combination of indicators to discuss, shared screens (smartphones, tablets, laptops) and printed samples of meaningful content or questions. 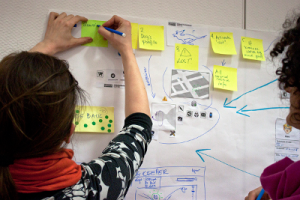 But before starting to build things “the co-creative way”, in the majority of cases is critical also to establish a good groundfloor for context, examples, issues, in a pre-defined area where the results of the co-creation want to create an impact. Starting by each participant bringing, ideally via the screen of a tablet or smartphone, an example or case of what they consider a good practise (app, portal, service, content, etc) and comparing them in pairs. Selecting one and sharing why with the rest, using some “thermometers” to balance important indicator levels like innovation, engagement, feasibility, etc. usually seems to help also starting to establish common criteria for deciding things together. The core starting point of the co-creation is the scenario (well, and the “persona” or end-user, more about that in another section below). But for generating, sharing, discussing and even remixing them, scenarios need some structure. In this case, we invite participants to imagine them in a sentence divided in no more than four postits, of different colours for each part. Without being strictly the same, scenarios can have something in common with the user stories that software developers need for their programs, starting as a simple sentence with “What if as a…”, and then adding a first temptative reference to who is going to be the type of user active in (or benefiting from) that co-created scenario. If initial examples are clear and there’s enough motivation from participants, the challenge usually is to narrow down choosing the most interesting scenarios group by group first, since people tend to be quite productive with postits! Is also crucial to give enough time in the program for all groups to present briefly their selected scenarios to the rest of participants, answering questions about any of them if needed, so the next refinement process takes place properly. When collectively diagraming, usually is more productive and straightforward to start to place elements on the table while discussing the design than trying to reach agreements beforehand, so people “think with their hands”. Once we have defined them a little bit more, filling special cards, it’s time to build around them the most clear diagram possible. When the content aspect is important, in applications, digital platforms or other type of knowledge oriented areas, like for exampleEuropeana assets or other type of copyleftuser-generated content, it will be also handy to prepare in advance visual cards (with images, text, QR codes for multimedia files, etc) which can be also connected graphically to the personas. What goes in between, as visual explanations of the relationships and actions of every item following the scenario description, should be up to participants and the materials they have on the table, by simply drawing or cutting and pasting. Slightly moderated from facilitators, apart from time management (and only when there’s some positions or technical aspects blocking progress), the provision of color markers, icons and symbols, pictures or magazines, even “3D raw materials” like Lego pieces or plasticine usually are enough for freeing creativity and manual brainstorming. This could be also an intense discussing and “P2P learning” session, while building metaphoric explanations that should describe a process, afterwards explainable from beginning to end to the rest. What people explain or ask during each presentation can give additional clues and insights about the possible solution co-designed, so documenting it with a video is good material afterwards for the final report. Although usually backlogs require more rounds of refinement in order to identify and agree on critical “todoes”, having an initial crowdsourced list of things to address for each co-design (once moved to a digital canvas) helps to start with the Scrum framework more naturally.